The Axiom Streamliner Road DLX rear rack is designed for road bikes with caliper brakes that don't have braze-ons or threads for mounting standard racks. 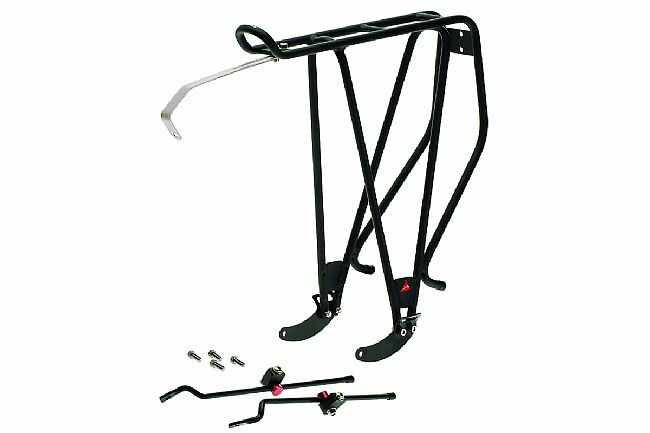 The rack has an arm that attaches to the rear caliper mounting bolt and legs that mount using your bike's existing quick-release skewer. The feet also set the rack 4cm behind the axle for excellent heel clearance especially on frames with short chainstays. Features a narrow profile that is more aerodynamic when loaded and also keeps loads closer to center for better stability. Hand-welded 10.2mm tubular 6061-T6 aluminum construction for strength and durability. Fits 700c wheels with fenders. Rack weight: 510 grams (1.12 lbs). Color: Black. This rack is easy to install and it works the way it should. As always great to deal with BTD.